I’m Charlie Nardozzi and this is the Vermont Garden Journal. My heart goes out to all those Vermonter’s still dealing with the devastation from recent floods. While the main priority is to get their homes and lives back together, eventually many will turn their attention to their landscape. 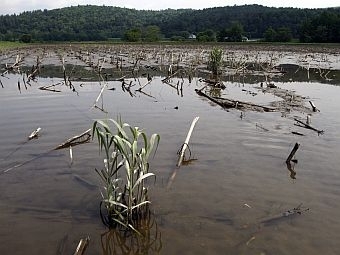 Flooded lawns, shrubs, trees, and gardens can look awful, but depending on what you’re growing and how long it was flooded, they may recover quicker than you’d think. In vegetable garden, any flooding that was due to rivers or streams overflowing is likely to contain chemicals and raw sewage. Unfortunately, you’ll have to till under all those vegetables still in the garden. It’s just not safe to eat them. Often after the waters recede, there will be a layer of silt on your garden. The best thing to do for your flooded vegetable garden is once the soil dries, till it and sow a cover crop such as winter rye. The cover crop plants will help recreate the air spaces in the soil plants will need and when tilled under next spring, supply essential organic matter. For trees and shrubs, how they react to flooding depends on what you’re growing and how long they were under water. Luckily, most of the recent flooding didn’t stand on the soil very long. Trees and shrubs that can withstand up to 1 week of flooding include red and silver maples, ash, river birch, dogwoods and winterberry. Trees and shrubs that are likely to suffer from even a day or so under water include daphne, juniper, yews, lilacs, and euonymous. To help trees and shrubs recover, rake off excess silt so it doesn’t smoother the roots, add mulch to help encourage air spaces to start forming again, and cover expose roots. Don’t fertilize until next spring. On flooded lawns, rake off excess silt, aerate the soil this fall and overseed with grass seed to encourage new growth before winter. Mother nature is as resilient as us Vermonters. With a little help your plants should grow strong next spring. Next week on the Vermont Garden Journal, I’ll be talking about asters. For now, I’ll be seeing you in the garden!